It’s the WSS intern again…miss me? If this is your first time reading my (masterful) work, you may want to check out my earlier posts when I bought Yahoo and when I bought P&G, so we’re all on the same page. I’d like to kick things off by taking a look at my current investments. Over the past few weeks, I’ve begun investing fake money on Wall Street Survivor, but in realistic conditions. I’m only investing a few thousand dollars, and trying to make decisions that I’d make if it were real money I was dealing with. So far, I’m holding stocks in Yahoo and Proctor & Gamble. My Yahoo (YHOO) stock continued to drop this week, down about $1.20 per share since I bought it 2 weeks ago (a loss of 4.1%). The biggest news out of Yahoo this week was its acquisition of eCommerce startup Lexity. This startup helps grow small online businesses with app platforms. This marks the 19th acquisition under CEO Marissa Mayer in the last year, and another one bringing in talent from the mobile industry. Clearly this transition in the company is geared towards a mobile-focused strategy, and thus a strategy I love. Mobile money is the future. Nay, it’s the present. And Yahoo plans to be at the top of that list with these moves. Proctor & Gamble (PG), on the other hand, is up. Just this morning, before the stock market’s opening bell, Proctor & Gamble released its earning for the latest quarter. These are the first numbers released since Proctor & Gamble reappointed their veteran CEO A.G. Lafley, so there were a lot of eyes on these results. Earnings numbers tend to be judged in comparison to the estimates set by leading economists before the company releases its report. In this instance, economists had estimated that P&G would post earnings of 77 cents per share. (Earnings per share is the profit of the company divided by the number of shares outstanding.) P&G beat these estimates, announcing earnings of 79 cents per share. A difference of 2 cents, who cares right? Wrong. Multiply that by the 2.74 billion shares of P&G out there, and suddenly those 2 cents ain’t looking too small anymore. So, on this morning’s exciting news, P&G stock is up 1.7% so far. Hopefully that number will continue to rise. But, factoring in Yahoo, my overall portfolio is still in the red. But we’re only a few weeks in here. Patience people, patience! No, I’m not planning on investing in the Australian Football League. Although, if I was, I’d put my money on this guy. For my third stock choice, I’ve decided to go with a third industry: the insurance industry. I’m taking a page right out of the book of diversification, and keeping my currently small portfolio split up into different sectors. My first two picks are stocks in the Technological and Consumer Staples sectors. This time, I’m going with the financial sector. For my 3rd stock, I’ve chosen the Fortune 500 Company: Aflac (AFL). More than 50 million people worldwide have chosen Aflac insurance. This company is over a half a century old, and its long reputation has made it a strong choice for insurance coverage. Aflac has what Warren Buffett would call an economic moat. (As you can see from my posts, I may have the slightest man crush on ol’ W.B.) An economic moat is some attribute of a company – whether it be a better technology, reputable brand name, impeccable sales team – that acts as protection from its competitors. Just the brand name “Aflac”, recognized all around the world, is Aflac’s economic moat. Its financials look good compared to the rest of its industry and sector. One of the best ways to judge a stock’s performance is to compare to its industry (Insurance) and sector (Financial). If it’s doing better than the industry average, chances are it’s a stronger choice than a majority of its competitors. Let’s take a look at some key statistics of AFL stock compared to those if the Insurance industry and overall Financial Sector, shall we? The Price-to-earnings ratio is basically how much investors are willing to pay for a company’s earnings (or profit). It’s calculated by dividing the current stock price by the Earnings Per Share (what we discussed earlier). So, let’s take P&G as an example. This quarter, they made 79 cents per share. Their annual Earnings Per Share (for the last 4 quarters) is currently 4.46. But their stock is trading at $81. This means that their P/E ratio is just over 18. This means that investors are willing to around $18 for every $1 the company makes in profit. (If you’re still confused, this video explains P/E ratio quite eloquently). But wait a minute? Why would someone pay over $18 for something that’s worth $1?!? I mean, you buy a stock because you believe it will make money, so why pay 18x the amount it makes? Well, the key word there is “will make money”. The extra money you’re paying is meant to pay for the future profit the company will make. Think of it like this. If you want to buy a bicycle, you’d pay more for a better quality bike if it’s going to last you longer and go for more miles. The same goes for stocks. You’d pay more for a better quality company that’s going to make more money over time. The P/E ratio attempts to capture that quality in a number. Our job as investors is to judge whether the price tag is justified or not, same way you’d make sure the more expensive bike is of a better quality. To do that, we typically compare P/E ratios to other companies in the same industry. Here we can see that Aflac has a P/E ratio of 9.65, which is a bit higher than the industry average P/E. This doesn’t worry me much, seeing as Aflac is a leader in its industry. There’s nothing wrong with paying a little more for a stock, as long as you can justify that price tag with the quality of business that you’re purchasing. There it is! 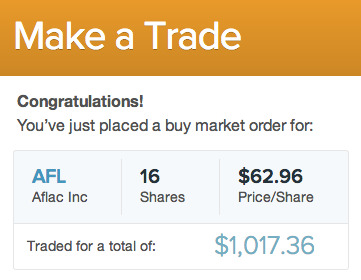 I just bought myself 16 shares of Aflac. Tune in next week to see how my investment portfolio is doing and any moves I might make. If you’ve got any ideas, insights or insults to share, feels free to share them in the comments section. Or shoot me an email. Invoice factoring is a financial tool whereby a company sells its outstanding accounts receivable at a discount in order to accelerate its cash-flow. With this financial tool, companies who sell their products or services in a B2B environment (Business to business) and offer their clients payment terms from 30 to 90 days, can obtain an immediate advance of up to 90% of their eligible accounts receivable once your client confirms receipt of the product or service your company is selling to them. Selling your accounts receivable to a company like Summar is called Factoring. Summar provides non-recourse invoice factoring facilities ranging from $100,000 to $5,000,000 which protect your company against any potential bankruptcy or insolvency from your clients. Non-recourse factoring: Non-recourse factoring means that you sell your invoices to the factoring company whom, under certain pre-negotiated terms, purchases your invoices without any responsibility back to your company. In other words, the factoring company usually purchases your receivables on a firm basis and will usually assume the risk of non-payment solely for credit reasons. If your Customer fails to pay for reasons different than his credit ability to pay for the invoice (or any other pre-negotiated terms or reasons) your company is still responsible to your client for any dispute they could have and to the factor company over the purchase of that specific receivable.